At Celebration Source, we pride ourselves in being your one-stop shop for all of your event celebration needs. From community festivals to corporate events, we do it all! Yet possibly our favorite event to throw is the carnival. Clowns walk around in their red, over-sized shoes, jugglers perform in front of children, their mouths agape in awe, and stilt walkers amble about like giants. 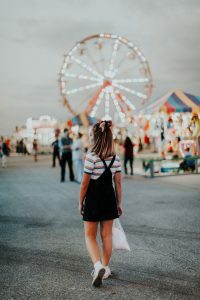 The smell of cotton candy makes even the most health conscious attendee’s mouth water with the prospect of some colorful, sugary clouds on a stick, and the screams of joyful fear resonates from the carnival rides. Children are creating memories that will last a lifetime and adults are swimming in the nostalgia from their own childhood. The carnival is truly a place of joy and has been entertaining children and adults in America for over a hundred years. Yet, where did it originate? Who rode the first Ferris wheel, or was lucky enough to try the first bite of cotton candy? Although there are many factors and some debate, we’re gonna take a quick look back at the beginnings of a couple of our favorite carnival attractions and food that still brings us delight today. The general idea of a Ferris Wheel actually dates all the way back to the 17th-century when passengers would ride in chairs attached to wooden rings, hand cranked by an operator. Although the idea was the same, the modern form of a Ferris Wheel that we know and love today didn’t come about until the late 1800s when a man by the name of George Washington Gale Ferris Jr. decided to accept a seemingly impossible challenge. His task… to outdo the Eiffel Tower that was built a few years prior at the Paris Exposition. Ferris was to unveil his creation at the 1893 World’s Columbian Exposition in Chicago (also known as the Chicago World’s Fair). Although there were a vast array of attractions to entertain, inform, or shock people (Nikola Tesla even demonstrated some of the electrical devices he had recently developed), the Ferris Wheel got the most attention. In fact, people were so new to even the idea of riding a chair at such heights, that security bars had to be installed to ease the passengers’ fears. Although it’s debatable whether Ferris rivaled the Eiffel Tower, most people have ridden his invention over a hundred years after its unveiling. Not only did the Chicago’s World Fair give us the Ferris Wheel, but it also woke up a yearning for adventure and thrills in our nation. The fair had rides, games, freak shows, wild west shows, and more, which in turn served as a catalyst for travelling shows/carnivals. The interest was clear and multiple companies began traveling along the railroads to bring the joy to towns all across the country. Without these early travelling shows or “midways,” we wouldn’t have the carnival games, rides, and foods that we know and love today. There is some debate as to where cotton candy actually originated (some say Europe in the 1800s, others claim a version of it was spun in Italy as far back as the 15th century), but we do know one thing, the first machine-spun cotton candy was invented in 1897 by two men named William Morris and John C. Wharton. Morrison was, of all things, a dentist! The pair introduced the candy then named “Fairy Floss” to attendees at the 1904 World’s Fair and it was an instant success (of course). Nearly two decades later an updated machine was created by a man in Louisiana named Joseph Lascaux and this was where the term “Cotton Candy” originated. Before this Lascaux earned his living as a… couldn’t be, could it?… dentist! One can smell conspiracy wafting around with the sweet smell of spun sugar. Yet, conspiracy or not we can all agree that the world is a better place because of these dentists and our favorite carnival treat. 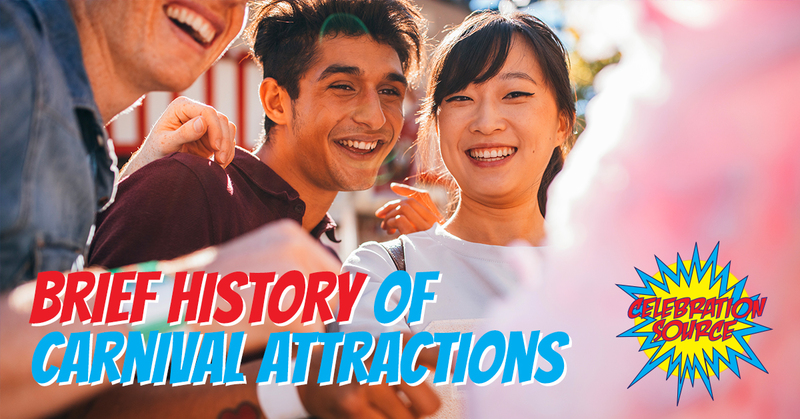 The history of carnivals is much more in depth and consists of multiple histories, inventions, and people, but we hope you enjoyed learning just a smidgen about the beginnings of the travelling shows, Ferris Wheel, and cotton candy. Let Celebration Source bring the same joy that was found over a hundred years ago to your home, work, or university. Contact us now to plan an event and browse our website to find the rides, foods, or party performers for you.